April 27, 2018 - 7 days overdue. Mild contractions began around 3am that I was able to sleep through. Seborn left for work in the morning and I grabbed my whimpering 2-year-old, Zion, and brought him back to bed with me to snuggle. He fell back asleep and I got up to be greeted by my 4-year-old, Shiloh. We headed down to breakfast and sat at the counter to eat together and chat. Slowly, the rest of the kids began to wake up and come downstairs. I was having continuous contractions that were very mellow. I continued on with mild contractions throughout the entire day, normally about 7-11 minutes apart. 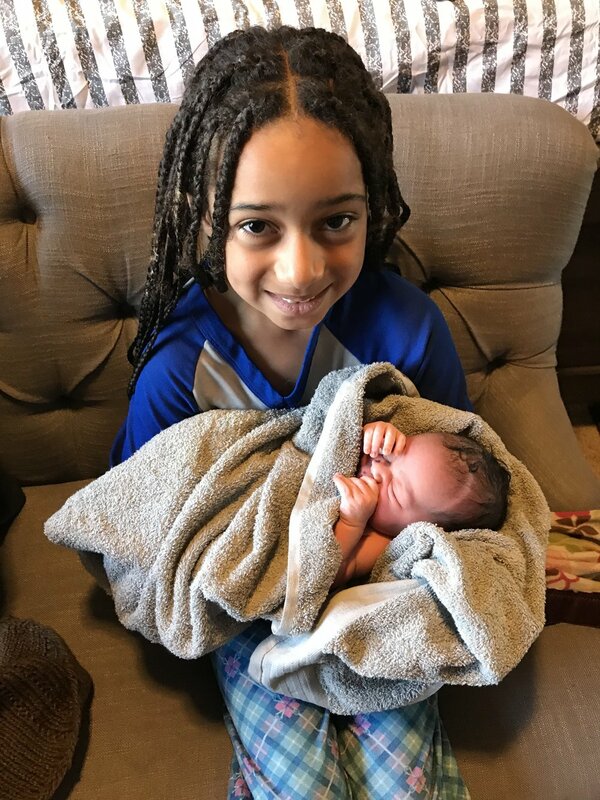 Around 2:30pm, my husband said he was leaving work early to come home and since contractions were consistent, I called my midwife to fill her in on the progress. She made sure I was eating and drinking and said we would check in with each other later in the evening. I don't know why, but I was stormed with emotions and with the anticipation of my husband coming home, I threw my head down on my pillow in my room and wept. I was overwhelmed with emotion. Maybe fear. Maybe nerves. But I needed to cry. Hard. For just a moment. Then, I bucked up, prayed to God for strength and joined my children back downstairs for some card games. I was so happy to see Seborn walk in the door around 3pm and I had prepared a meal for us all. After eating an early supper, Seborn and I decided to head upstairs really quick for some "bedroom time" to possibly get things rolling a bit faster. At this point, we've been going on 12 hours of labor and I am wanting to stop and focus during contractions which are now 6-9 minutes apart. Since it was already evening, we decided we would keep the kids with us (instead of having my parents pick them up) and just relax with them before putting them to bed. Praying and seeking the Lord for strength during this time as lingering labor is just not that fantastic to experience. We took a family walk to the park. It was so fun to see the kids running around and laughing and playing. It started to sprinkle so we walked back home and daddy took the kids to get ice cream. We finished off the night with family movie night with The Greatest Showman. We put the kids to bed at 8pm and I tried to keep it cool as my mind was swirling with emotions of this labor as I was kissing the kids goodnight. 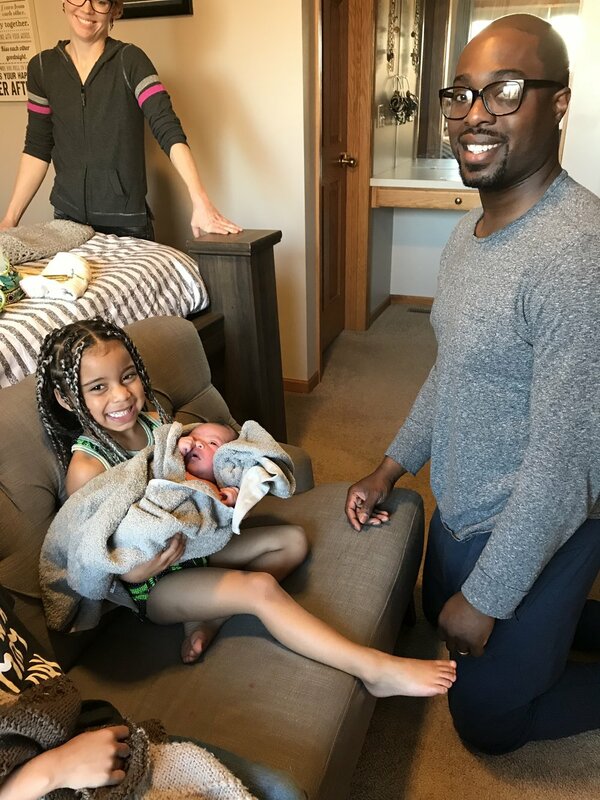 I had been trying so hard to stay in the present moment with Seborn and the kids all afternoon and evening but the thoughts of impending labor were consuming me as I continually was experiencing contractions and waiting for them to pick up the pace. Along with contracting all day, I also had excessive loose stool. I was eliminating every 10 minutes or so all day long. I was constantly on the toilet throughout the entire day and didn't even have much of an appetite to get more food in, but just kept having everything come out. This made for a pretty sore bum by the end of the day. I took a relaxing bath with some essential oils and my contractions halted during that time and then I tried to relax in bed for a while until it hit about 10pm. I checked in with my midwife and let her know that I hadn't reached any further progression in labor so was going to try to get some sleep. Upon setting my phone down on my nightstand, I had a big contraction while laying on my side and it got super intense at the end and I felt a huge POP and then a gush of water. My water had broken and it was yellowish brown (meaning there was meconium in it.) I picked up my phone to chat with my midwife about it and we said we would stay connected. Because of this change in labor, Seborn and I decided to head back downstairs, watch a show together and see if things progressed even more. My contractions were 4-5 minutes apart for the next 2 hours until about midnight when we decided to try to get some sleep. Upon getting back into bed, our goal was to get even a little bit of sleep. I was able to calm down enough to "rest" for 10 minutes at a time before I needed to focus on an intense contraction. Everyone 10 minutes, I was awoken from the next wave. I'm not even sure how productive my "sleep" was in between contractions because my mind was overwhelmed with thoughts. This continued on for 3 hours until 3am when my contractions suddenly became more intense, lasted longer and were 2-4 minutes apart on average. I needed to get up from bed and be in an upright position for contractions. We turned our mood lights on, put worship music on and my diffuser. 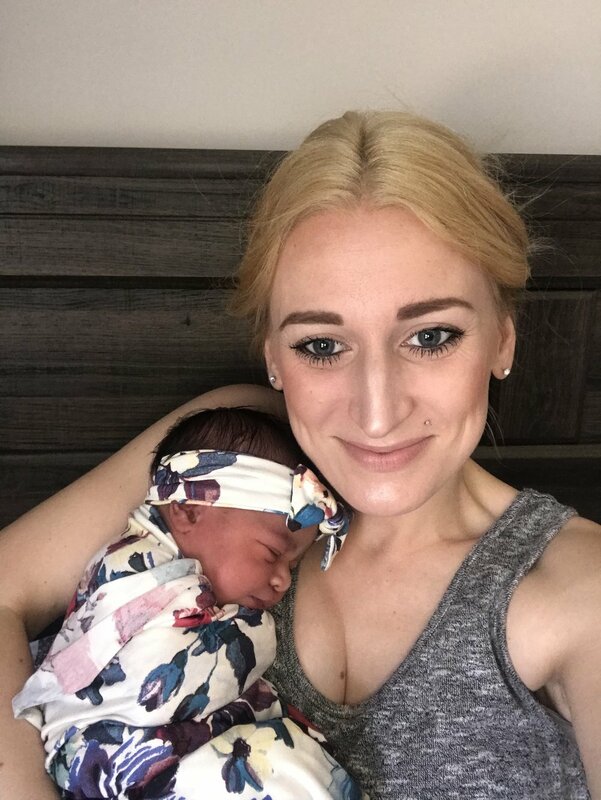 Seborn and I discussed if we should call our midwife and let her know about the sudden change of pace and so, at 3:15am, I called her and we decided I would give it another 15 minutes to call her again and see if labor sped up more. I hung up the phone, had a huge contraction and told Seborn to call her right back and to start her drive to our house. Contractions continued to come and were very intense. I am a diehard toilet laborer. Most of my active labor is spent over the toilet. My moans were becoming deeper and longer to help me get through each wave. My midwives arrived on the scene and quietly began to set up their supplies in our bedroom by 4:15am. All the kids were still fast asleep and I felt comfort in knowing they were all tucked in their room safely awaiting their sisters arrival. I didn't know how much longer I would be in labor for but I needed to hold onto Seborn for my contractions now. I told Seborn that I wanted her to be born before 6am. I wanted to give all the kids the surprise of their lifetime when they woke up in the morning. Off the toilet and into our bedroom while standing on a large pad, I held on to Seborn's waist during each contraction and watched the blood drip down from me each wave. I had 1-2 minutes between each contraction and would pray and my labor became a worship to Jesus. It felt so peaceful. I knew the next wave would be coming and I would be closer and closer to pushing. I anticipated the urge to push but patiently awaited it because I knew once I started, I would have to keep pushing until she came out. I wanted to try sitting on the ground so sat between Seborn's legs for 1 contraction. Nope. I leaned up on my knees on our couch in the room for the next contraction. Nope. I needed to get back on my feet and put my arms around my husband while leaning forward. That was my position. And the urge arrived. Each new wave presenting the intense pressure to push. I beared down and pushed gently yet intentionally. I asked my midwives if they saw her head yet and they said, "She's coming soon, Meghan. You are doing great." The urge came stronger and I pushed harder, bearing down as hard as I could. The head was coming out. I needed to keep pushing. I needed to catch my breath and make very purposeful pushes. Intentional on the muscles and force to get her out. Praying and pushing. Finally, her head was out. I always would hope that my babies would just slide right out after this part, but they never have. My pushing was not done yet. I tried to push the rest of her body out but she was so snug and tight in there that one of my midwives needed to hook her shoulder a little bit to help slide her out. After 3-4 more intense pushes, her body came out and I practically lept out to Seborn to hug and kiss him. Then I sat down and turned around to see my baby girl. She was perfect. Absolutely perfect. It was such a miraculous and holy moment. Sitting there in the calmness of the early morning hours in our bedroom feeling empowered and capable at the miracle God just laid in my hands. There were so many times throughout this process that I wanted to give up, that I wanted to find an easy out but Almighty God brought me through it with such grace and faithfulness. Arrow Journey Gray Yancy was born at 4:54am on April 28. I held her in my arms for 2 hours, sitting on my bed with her still attached to her placenta through her umbilical chord. It was so neat to watch my midwife push all the blood left in the chord back into Arrow's body through her still attached chord. The entire morning was so laid back and relaxed. I sat in bed and nursed her. She instantly latched on and we breastfed there on the bed so sweetly relaxed together. One by one, my other children groggily woke up and made their to our bedroom and rubbed their sleepy eyes to reveal their new sibling. It brought me so much joy to watch each of them crawl onto the bed and gasp with pure joy and gratefulness. I cherish those moments. 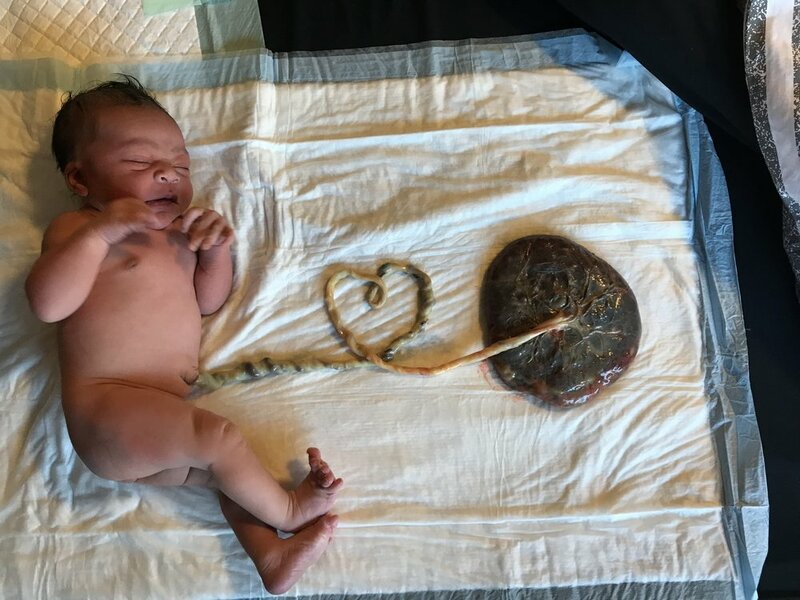 After examining the placenta, Seebz cut the chord and held onto his new baby daughter as I went and took my highly antipated post-birth shower. Upon getting out, I felt so light-headed and needed to get down on the ground and regain some energy. Realizing how my body eliminated so much the prior day, giving birth to a baby and not being able to intake much food in the given timeframe, my body felt so depleted. And I was so grateful to be home. I crawled into my bed, all fresh and clean and snuggled with my family. My midwives did the routine to check up on baby Arrow and she weighed in at 7 pounds 9 ounces and 21 inches long. Big girl all tucked into my belly because even at 41 weeks pregnant, I was only measuring at 35. The exam on me showed no tearing and barely even any swelling. Which means my healing will be even better. I have been dreaming about these moments of after-birth for months. Waiting patiently to live them out. And we spent the rest of the day resting. Napping. Snacking. Snuggling. Family coming to shower love on this new addition and basking in the peacefulness of home. I'm so grateful for homebirth, my amazing midwives, and the sheer miracle of birth. God is so good. The days to follow have been peaceful, calm and relaxed. My instructions are basically to rest in bed for at least the first full week. I love that. I allow my mind + body to rest while my husband and family support that healing time. Plus, I get such sweet time to bond with my new baby. It is pure bliss. On day 2 of Arrow's life, we gathered around our bed and my dad prayed a blessing over her life, praising God for every part of who she is. We all prayed in agreement with him and then my dad and husband anointed her with Frankincese essential oil. It was a beautiful moment all together and one that was impactful. God brought this beautiful blessing into our lives and it is with purpose and passion we gather to praise Him for His goodness.